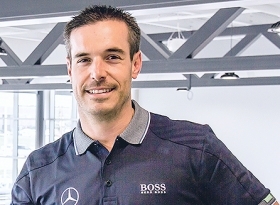 Given Brian Lowes' swift rise from washing cars at a Nissan store in 2003 to running Mercedes-Benz Winnipeg just five years later, you'd think he was groomed for auto retailing by a family of dealers. But Lowes' father is in management with Chevron and his mother has been a teacher's assistant for 30 years. So Lowes could have taken a number of career paths, but he was drawn to the car business. He said his love of cars started when he was a child, using AutoTrader magazines as coloring books. "It's a bit of an oddity," said Lowes, who grew up in Edmonton, Alberta. "I'm the first guy in our family to be in the car business." Lowes, a licensed automotive technician, has had many dealership jobs over the years, from washing cars to working as a service technician, service adviser and used-car manager. He said his career gained momentum during those years as he learned the ropes and took advantage of opportunities. He became general manager of Weber Motors, a Mercedes-Benz dealership in Edmonton, in October 2007, then took over as dealer principal of Mercedes-Benz Winnipeg in November 2008. So how did he get his own store before turning 30? Lowes said he put together a deal with the children of the dealership's previous owner. They footed some of the bill as investors, while Lowes stockpiled cash by selling his real estate investments in Edmonton. "It was literally every penny I had and then some," Lowes recalled. Now Lowes wants his employees to have the same chances for advancement that he did. "I want to be in a position where I'm able to support those opportunities. That's going to mean more stores. That's going to mean more businesses," Lowes said. "Growing to be able to allow the people who have been with me from the start and are on our team and engaged and have that twinkle in their eye. ... I want to be a part of their success. I want to be a part of their story." Mercedes-Benz Winnipeg has received Mercedes-Benz Canada Star Dealer honors -- awarded based on performance in new- and used-vehicle sales, service, parts and customer satisfaction -- twice in five years thanks to a rise in customer satisfaction, Lowes said. The store's customer satisfaction ranking improved from No. 15 among 56 Canadian dealerships to second in just three years, he said. Lowes has overseen construction of a bigger Mercedes-Benz Winnipeg store that was slated to open on July 6. The project posed a number of challenges, including finding land for the store and dealing with the city. "Right now, our business is at a transition point as we go from a small store that's 19,000 square feet to a new store that's 55,000 square feet -- and all of the things that's going to bring. It creates a number of opportunities for a whole bunch of guys and girls who've been working really hard for a long time," Lowes said. "With that kind of challenge and excitement comes opportunities for these people to step into some pretty big roles."